The average seat at New York’s most beloved circus was $25 in 1981, our first season at Lincoln Center. A Zabar’s Bagel cost 35¢ then, now $1.66. Today our average ticket is $50. 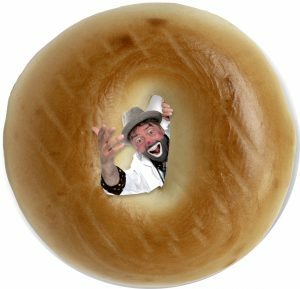 By bagel math, it should have risen to $118. Our performers soar, but our prices don’t. That’s part of our mission as a not-for-profit arts organization. On the quiet side we are deeply engaged in raising the spirits of hospitalized children with our heralded Clown Care program. Our 2015/16 show got rave reviews. It was a New York Times critic’s pick and played to over 200,000 people. In popcorn numbers, that’s 9 bazillion kerneIs. In dollars though, that’s not enough. After many years of balanced books, the 2008/9 financial crisis hit. Suddenly big companies canceled private parties with us––let’s just say the optics of throwing a lavish holiday party in the midst of crashing markets would rival a solo performance by Nero on violin. Then a blizzard in 2011 and a massive hurricane in 2012 nearly blew us away. We were too slow to react. We need $2 million or we’re toast. Okay, mea culpa, but a major plan is now in place to right our valiant ship and sail into the future. But we need $2 million to open our new show at Lincoln Center and remain one of New York’s treasures. That’s a lot of bagels. If everyone who reads this ad donates $25 we’d be saved. There are more urgent causes that deserve your generosity, but none that give more joy. Please help preserve one of the most wonderful experiences of your life for yourself, your children, and your grandchildren. In 1981 an H&H Bagel was 50¢ and today they’re out of business. That can’t happen to the Big Apple Circus. Can it? Please consider contributing online at www.SaveTheCircus.org. And please share this important message with your family and friends. While writing the blog about my most recent stint with Circus of the Senses, I was reminded of the very first Circus of the Senses in 1988. I was one of three commentators at that very first event alongside two men whom I greatly respected and admired: Marty Glickman and Dave Jennings. The other commentator was Dave Jennings. 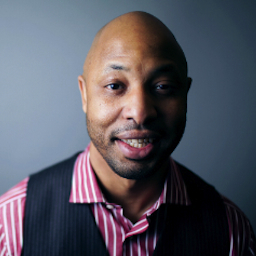 Dave was a football punter who played for the “New York Football Giants” and the New York Jets. 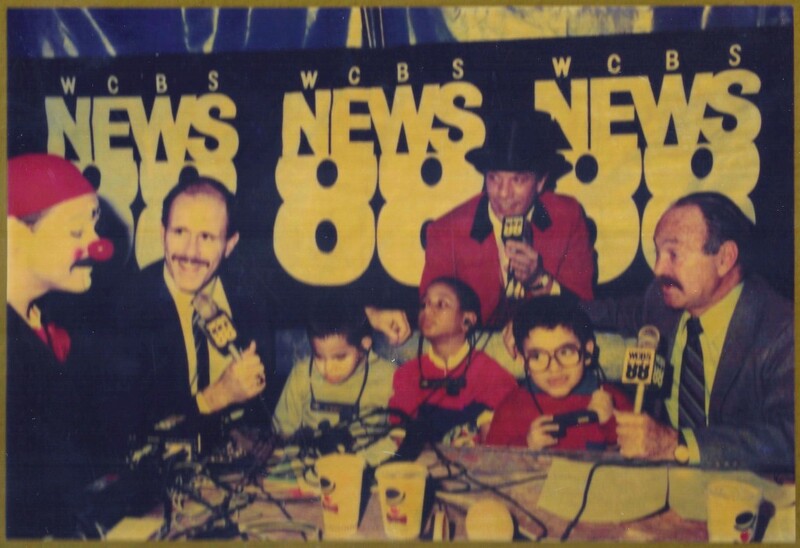 After his career with the NFL as a punter, he worked as a radio commentator for both the Giants and Jets games from the booth and in the locker room, covering player interviews both pre and post game. The photograph above is the only one I know about from the first Circus of the Senses. In the back row from right to left are Marty, me, Dave, and Mr. Gordoon (Jeff Gordon). The three boys in front were visually impaired and are listening to our commentary through their personal hearing devices. Now, can you imagine how excited I was for the very first Circus of the Senses as I stood between Marty and Dave? Me, a Brooklynite, sandwiched between two iconic New York sports celebrities. I was thrilled. My longtime performance partner Michael Christensen joined me as commentator during the third year of Circus of the Senses, and since that time, the two of us have done many events together. 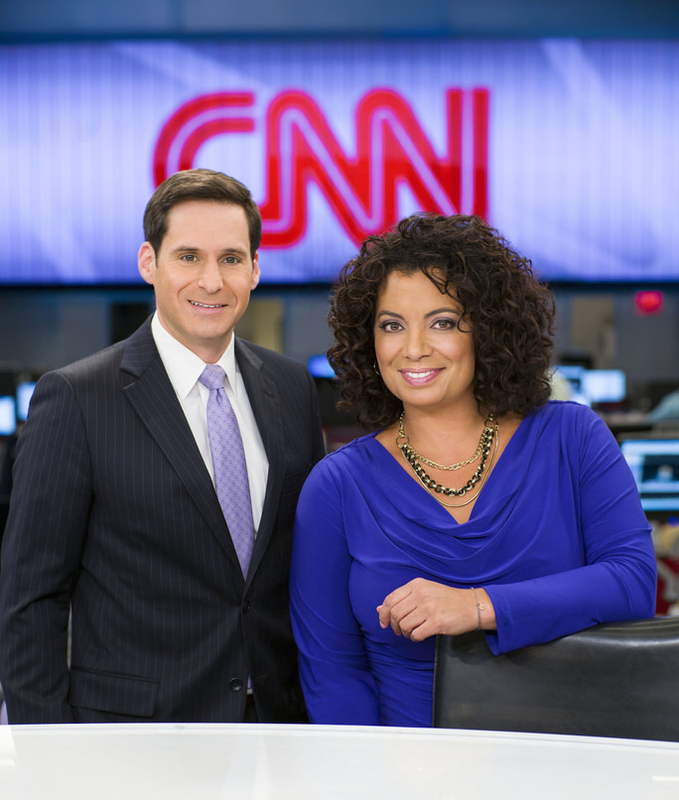 This morning I went on CNN’s “This Hour” with John Berman and Michaela Pereira. They asked me to be on as a circus expert. If you haven’t already heard, there was a terrible accident yesterday in Providence, Rhode Island. During an aerial act in Ringling Brothers and Barnum & Bailey’s “Legends” show, something went wrong with the rigging equipment and eight female performers fell from a height of over twenty feet. A dancer on the ground was also injured. 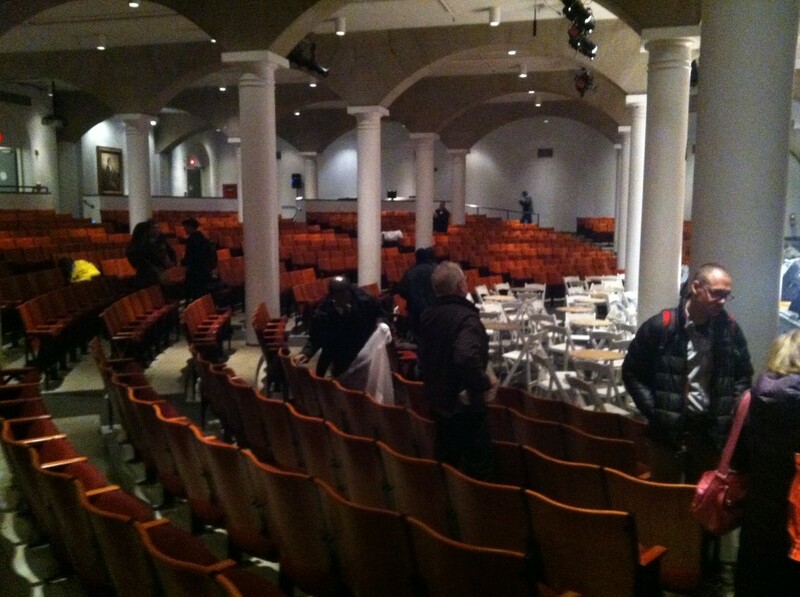 A few audience members caught the tragic moments on camera and have posted their clips online. The video footage is startling. Fortunately, the Ringling team responded immediately to the accident, and emergency vehicles arrived quickly. As of this morning, eight circus members were still hospitalized. CNN reports that two of them are in critical condition. One of the young ladies, Samantha Ellen Pitard, posted on Facebook that all of them were conscious and talking, even those said to be in critical condition. My thoughts and prayers are with the performers, their families, and the entire circus community. This is an awful and tragic accident. As circus performers, we know that such accidents are always a possibility, but because of our extreme care and safety practices, these types of things rarely happen. A major question of the broadcast was whether or not dangerous circus performances should even be performed. As John Berman said, though, part of the circus is about taking risks, and as I reiterated, safety is always a huge concern with the development of any act. Safety measures are put into place as each act develops, and equipment is meticulously inspected before and after rehearsals and performances, often by the performers themselves. Yesterday’s accident seems to have been a rigging failure, and an investigation is currently underway to determine the exact cause. However, I’m positive that Ringling Brothers was thorough in their safety inspections prior to the incident and would have done anything within their power to prevent such a thing from happening. It was great to see Luciano, and it was also a pleasure to meet John and Michaela on CNN. I only wish it had been under happier circumstances. It’s been a week since The Moth event, and I think I’ve almost fully recovered. It was an incredible night, and I was honored to share the stage with a handful of incredible storytellers. A stage, I might add, on which Abraham Lincoln once stood. Oy! 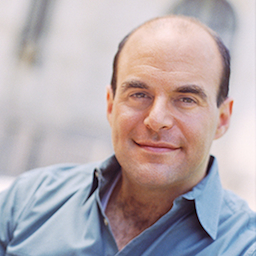 First, a correction … Last week before the event I said that Peter Sagal was going to be the MC for the evening. Well as it happened, Peter was one of the other storytellers, and oh boy, was his story excellent! 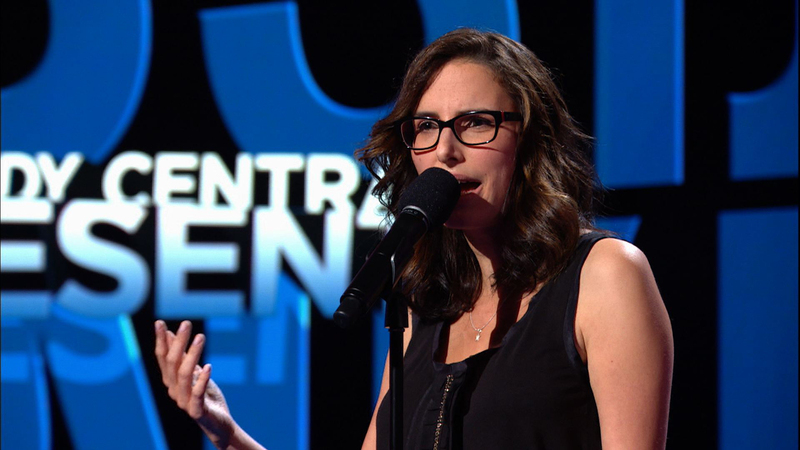 As it turned out, the host for the evening was the writer and performer Jessi Klein. 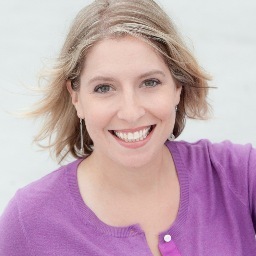 Jessi is currently the head writer and an executive producer for the show Inside Amy Schumer on Comedy Central, and she’s a regular panelist on Wait Wait … Don’t Tell Me! And she did a fantastic job as MC. 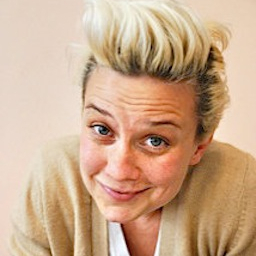 Between storytellers, Jessi shared her own brief anecdotes dealing primarily with the subject of how flirting can lead to disaster—a creative way to tie together the evening. After all, the title of the event was “Flirting with Disaster: Stories of Narrow Escapes” and last week was Valentine’s Day. The air date is still yet to be determined, but you can be sure that I’ll tell everyone I know when the date and time have been finalized. I don’t want to give away any of the stories that were shared last week so that you can all thoroughly enjoy them during their broadcast, but I do want to encourage you to be on the lookout for my fellow storytellers: Tara Clancy, Nicole C. Kear, Shannon Cason, and Peter Sagal. When you listen to the broadcast, I’m sure you all will be as enthralled by their stories as were the 900 audience members at Cooper Union last Monday night. A huge thanks to everyone at The Moth Radio Hour for making me (how shall I say?) sweat …. This week, many of us will be heading into the kitchen to prepare a meal for our families and friends. I myself am no great chef, but every year around Thanksgiving I’m reminded of the time I worked for one. The following excerpt is from my book Never Quote The Weather to A Sea Lion… (available for purchase here). In 1963, barely out of Dartmouth College, I’d been hired as floor manager for a little cooking show aired by Boston education channel WGBH. 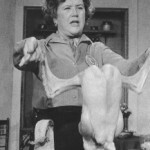 The show was called The French Chef, and the chef, of course, was Julia Child. Julia was an imposing figure. At six feet two inches, she was taller than I was, but it was her passion that wowed me. She loved the food that she’d discovered in Europe and wanted all of America to share her discovery. On my first day I was naturally nervous but resolved not to let her see it. That was no easy task, as I was positioned twelve feet in front of her. During that first taping, I heard the voice of Russ Morash, our director, loudly through my headset: “Tell her she’s sweating, Paul.” I quickly thought about the various ways of putting this tricky, personal, potentially embarrassing matter to her; then I wrote one word on a large paper pad and held it up for her to see: PERS-PIR-A-TION. A moment later she casually mopped her brow with a dishcloth, and I thought to myself, Whew, I got that right. Folks, when you’re in the kitchen tomorrow, and you’re afraid the turkey’s too well done, or Grandma won’t be impressed with your take on her famous sweet potato casserole, my advice is: don’t sweat it! Just be grateful for the opportunity to be surrounded by loved ones. And remember, if you find yourself acting a little stir-crazy, you could always gather up all your visiting relatives and bring them to the circus! Happy Thanksgiving! My mother loved a parade! My mother loved a parade! 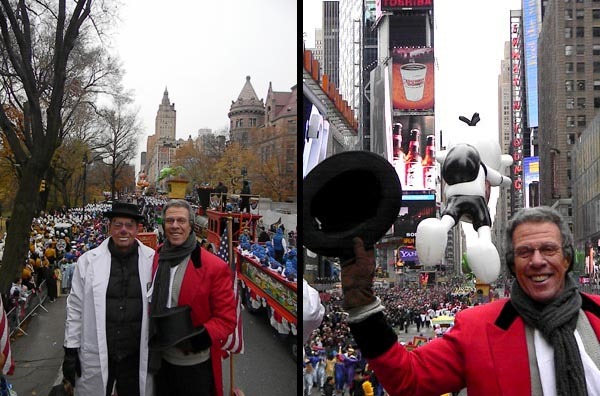 She specifically loved the Macy’s Thanksgiving Day Parade, which has been a NYC institution since 1924. In 1946, one month after my fourth birthday, my mother put a nickel in the subway turnstile, I walked under it and we traveled from our home in Brooklyn to Manhattan to see the parade — and to this day, I still remember my head swimming with excitement as we rode the subway to the parade route. By the time we arrived, the crowd was at least five deep and impossible for a four-year-old who fit under the turnstile to see what was happening. Undaunted, my Brooklyn mother had an inspiration and turned to the tallest man she could find in the crowd, a perfect stranger, and asked if her son could sit on his shoulders. What a wonderful man, I must have ridden on his shoulders for more than an hour that day. The parade was so exhilarating, for years, I could name — in order of appearance, every band and balloon character I saw that day. 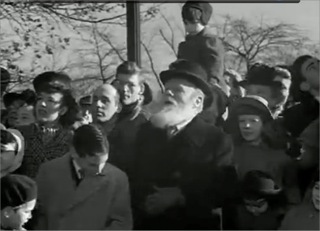 Screen-grab from Miracle on 34th Street: Edmund Gwenn, a.k.a. Kris Kringle in beard and hat; Paul Binder, above. And, sure enough, there I was, at the parade, on the shoulders of that wonderful stranger, preserved for the ages in film history. The fella in the front is the star of the film Edmund Gwenn, Kris Kringle. The kid up above him, with the ear flaps? Me. Looking back, not realizing it then, show business, or more specifically, the business of people was my destiny. 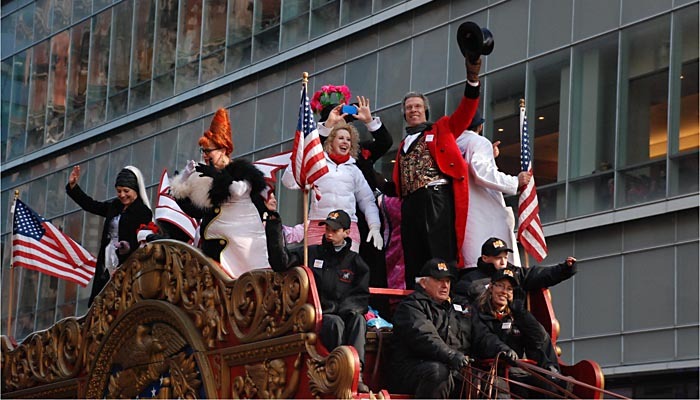 2011 Thanksgiving Day Parade: Paul with some of the “Dream Big” cast. On the wagon, left to right, Jenny Vidbel, Jenna Robinson, and Muriel Bruggeman. The wagon is supplied by the Circus World Museum in Baraboo Wisconsin as an authentic Bandwagon, circa 1903, and drawn by 6 percheron horses form upstate NY. Hello. Happy NEW YEARS! On a episode of “Circus” you said a great quote by Walter Cronkite, but I was unable to find it online. I re watched all the episodes on PBS.org but could not locate the clip. The quote was something like, “It’s been a season of all seasons…events of our lives?…” I think it was either in episode 5 or 6 in NY. I would really love to know the full quote. I really appreciate your time. I hope you enjoyed the documentary series. Sandi confirmed that she did indeed enjoy it. Walter Cronkite confirmed what Katja had said when he came backstage after the show and greeted her like he was her favorite uncle. After all he had watched her grow up. 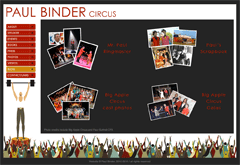 Did you miss the PBS series “Circus”? On November 3rd PBS launched its documentary series “Circus”, and the viewing is not over! If you missed six hours of broadcast over the last three weeks, watch the on-line streaming.